It took seven rounds to get their first win, but with a 9-2 win against NYUSC the TVFC Under 12s showed how far they have come in a short time. 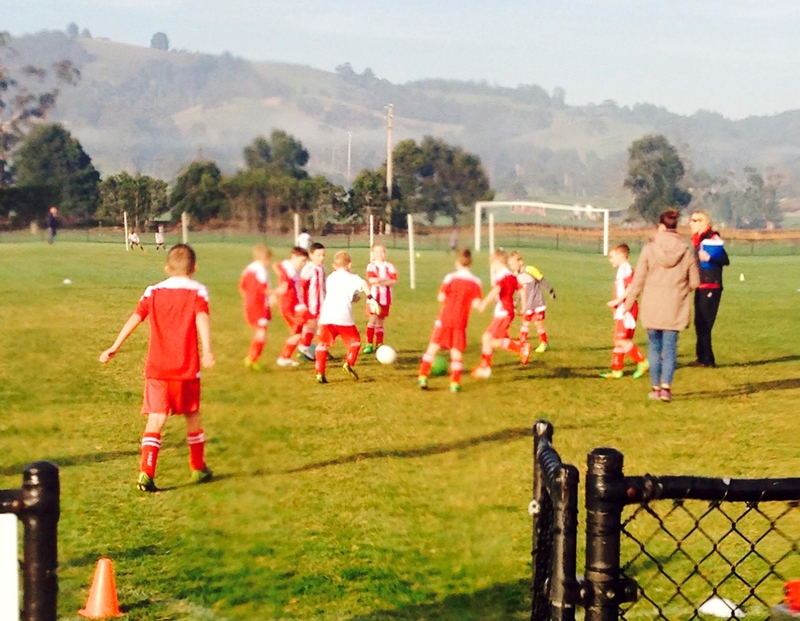 In round 1, the under 12s lost 11-0 to a strong East Gippsland team. It was a tough introduction to junior soccer and the first time the entire team had played on a full size pitch. For much of preseason the team had practiced individual fundamental skills, however with the commencement of games the focus has shifted to team structure and player roles. To the team’s credit, all players in the team have committed to working hard and making sure they improve with each game. As a result, the gameplay each Saturday has clearly improved and the team has provided the opposition with some tough competition. Which brings us to our round 7 match against NYUSC. Pre-game, energy was high and the team was keen to start. This week’s captain was Mieke, who won the toss and elected to take the kick-off – a great decision, as the ball was quickly pushed deep into the NYUSC half and stayed there for the majority of the first 15 minutes. The starting TVFC mid-field of Zane, Riley, Yelan and Braeden did a fantastic jobs of pressuring the opposition and keeping the ball boxed in the NYUSC half. Alekslandr was proving to be too hard to contain and with a number of outstanding runs was able to cut through the defence and kick two first half goals. With a two goal lead, substitions were made. Trafalgar continued to play well, Kyen demonstrated some excellent vision, and brought team mates into the game with great passes. Lola showing her talent as a throw-in specialist, providing opportunity for the team to run the ball down the side line. Mackenzie and Beau ran hard in the midfield shutting down opposition counter-attacks. Defenders Aaron, Harry, Logan, Mieke and Ava were excellent. By working together as a unit and co-ordinating their back four structure, they ensured keeper James had very little to do in the first half. Logan was also especially effective in providing options off the many corners won by the team. TVFC finished the first half with a 2-0 lead. In the second half, James moved from GK to forward along with Braeden and their combined running speed proved too much to handle. With the opposition clearly fatigued, mid-fielders Zane, Yelan and Riley continued to move the ball to the strikers at speed and to their credit, the strikers finished the job. In the second half Braeden scored 3 goals (plus a shot that forced the keeper in scoring an own-goal), James scored 2 goals and Zane scored 1. While many of the goals demonstrated some excellent finishing, the highlight of the game (at least for me) was a play the started by Yelan winning the ball on the left side. While dribbling the ball he lifted his head, saw Braeden and played an excellent pass. Braeden then beat his defender and could have taken a contested shot but instead, squared the ball to an open James inside the penalty area. James trapped the ball and calmly placed the ball wide of the keeper into the back of the net. This passage of play really demonstrated the player’s growth and ability to take the drills practiced at training and apply them match day. Congratulations to our Under 12 team and a great reward for all your efforts! Thanks to Paul Connolly for the excellent photos! 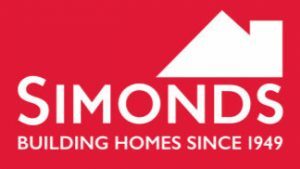 Urgent: New Committee Members Needed! TVFC’s Annual General Meeting is to be held on Wednesday 9th November, 2016. The meeting will be held at Café Obsession 71 Princes Hwy, Trafalgar and begin at 7:00pm. At this point in time, we have no nominees for these vital committee positions. Without an executive committee, we cannot continue as a club! 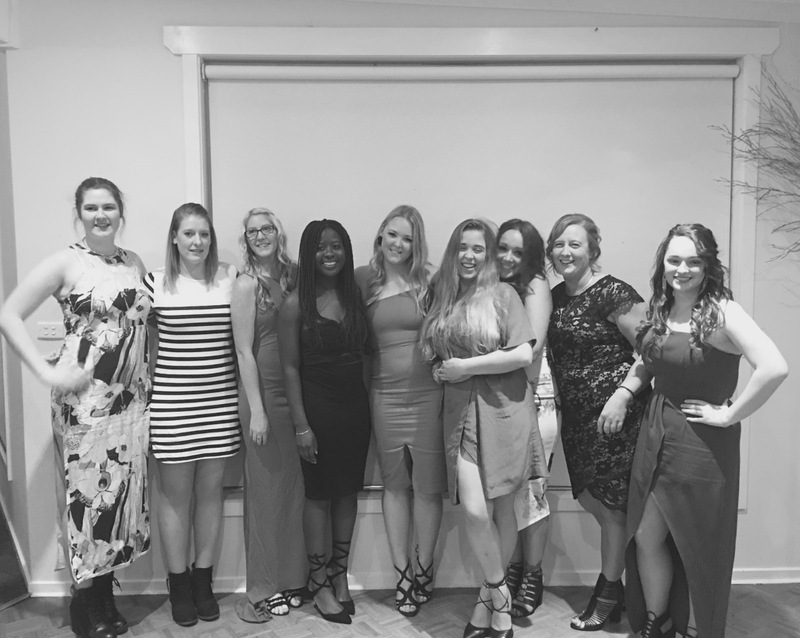 The Trafalgar Victory senior teams celebrated the end of the 2016 season with its annual presentation night. Once again, the occasion with held on the 22nd of October at the Black Tie in Warragul. A special thanks must be extended to Emma Hudson and Lachie Wyatt for organising the event. The night also honoured former TVFC President Wayne Jones, who passed away earlier this year. Instrumental in setting the foundations of the club, Wayne volunteered as a committee member and junior coach. Wayne was always keen to watch his boys playing for TVFC, he was a great presence and social member. To honour Wayne, TVFC have dedicated the club’s bar as ‘Wayne’s Bar’, with Grant Fowler providing a sign that will hang over the bar in perpetuity. TVFC’s senior coaches, Eamon O’Hare (Men’s Coach) and Tony Wyatt (Women’s Coach) were also thanked and presented with a gift from both the playing group and club. All in all, a successful and entertaining night. 2016 Reserves Best and Fairest runner-up Monty (left) and winner Mick Byrne. Despite playing a new position in the middle of defence, Mick Byrne had a solid season providing stability and leadership to a youthful reserves team. In a tight race for Senior Women’s Best and Fairest, Bridget Wallace narrowly defeated Amanda Hines by 2 votes. Amazingly, the two girls polled 74 votes of a possible 132. Coach Tony Wyatt praised Bridget for her on-field commitment and work rate, as well as her ability to lead the team. 2016 Senior Mens Best and Fairest runner up Cohen Bayles (left) and winner Conner Wyatt. In another tight race, the senior men’s Best and Fairest was decided by 2 votes, with Cohen leading the count right up until the last round. Unfortunately for Cohen, in the last game of the season Connor was awarded 3 votes and secured the award. Connor who’d previously won the award in 2014, has proven to be a highly effective defender at the senior level – and without doubt given more than a few nightmare’s to the strikers around the league. After a move to the centre of midfield, Tanya’s possession, ball distribution and improved confidence impressed Coach Tony Wyatt so much that during the presentation of the award he lamented not making the move sooner. Tanya was also praised for her effort and ball winning abilities. 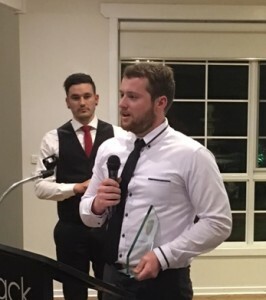 Monty earned the Reserve Men’s Coaches Award for his dedication for training, hard work on game day and supplementing the senior list when required. Many times this year Monty backed up a 90 minute run in reserves with significant minutes in the senior team. 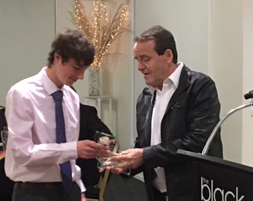 Coach Eamon O’Hare commended winner Cohan for his improved play throughout the season. Cohan displayed a tireless motor this year, playing all 1,980 minutes of the 2016 season (and some in Reserves too!). Showing that her Best and Fairest award was well deserved, Bridget was the clear choice of her teammates as Player’s player. There was no player more worthy to win this award than Sam Jones. Sam was the first TVFC player to move through the club’s junior program into the Senior level. In many ways Sam is the heart and soul of the Traf Men’s team. Despite a difficult year with the loss of his father, Sam was consistently a positive and uniting force, willing to do the blue collar work that’s required to make a team successful. The were two incredibly worthy nominees for the 2016 Club Person of the Year award, those being Kara Kimberley and Dylan Wyatt. In 2016, both nominees undertook committee membership, junior coaching responsibilities and co-ordination/delegate roles. As if this wasn’t enough, both nominees spent countless hours improving the clubrooms, running the canteen and organising other volunteers. TVFC is grateful to have such outstanding members within the club, and in some ways it is unfortunate that only one is singled out for this award. 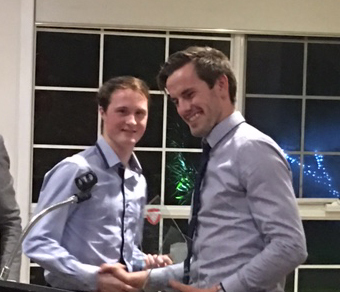 The winner of this year’s Club Person of the Year was Dylan Wyatt. In 2016 Dylan was President of the club, coached the Under 16s, was the senior LVSL delegate and the lead in procuring our new Club Merchandise. Though unable to play this year due to injury, Dylan is also a key member of the Senior team – and has played the role of unofficial life coach to many of his peers. 2016 Presentation Night. 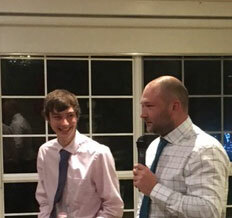 Mark Judd (left) presents Club Person of the Year to Dylan Wyatt. Congratulations Dylan on a well deserved award. TVFC’s Annual General Meeting is to be held Wed 9th Nov, 2016. The meeting will be held at Café Obsession 71 Princes Hwy, Trafalgar and begin at 7:00pm. If you have any concerns or would like to voice an opinion about how the club is run, this is the best forum to do so! TVFC strives to be an inclusive club and values participation from mini-roo, junior and senior members. So please step up and volunteer/nominate for these roles! If you would like to discuss joining the committee, please call Dylan Wyatt on 0400 505 320 or Templar Hankinson on 0488 103 085. Make sure you get your tickets for Presentation Night! The Trafalgar Under 13 girls team faced Falcons in their semi final game this week. Falcons have had the better of all three matches played this season between the two teams and have won the league championship so are a formidable opponent. The team was quietly confident before the kickoff but within 6 minutes the Falcons team was in control with a 2:0 lead. The team work of the past two weeks had disappeared and the Trafalgar team struggled to move the ball forward. Livvy tried her hardest to get the team going with some beautiful through balls but the Falcons team were quickest to the ball and easily repelled all attacks. Nat, Haylea and Allyssa all battled valiantly in the midfield but the ball would not go our way. Any 50:50 balls fell to Falcons and caught the Trafalgar team on the wrong foot. Maddy and Skye tried to create some forward chances but the Falcons team were equal to any thing that was put to them and defended well. Nyah, Tia, and Mackenzie were under pressure in the backline but they were able to keep the attacks under control. Gabby showed off her improved goal kick skills with several lofted clearances that got the ball well up the ground but we still couldn’t break down the Falcons defence. Ivy replaced Haylea up front and battled well to put some pressure on the defenders. The Trafalgar team started to get the game on a more even keel but just before half time the Falcons team again broke through and scored a third goal. The whistle blew for half time allowing the Trafalgar team a chance to catch their breathe and regroup. The message to the team before the game had been to smile and enjoy the experience. With a lot of downcast faces they were reminded of that initial message. Maddy and Livvy started on the bench to give them a much needed break. The second half began as an arm wrestle with the Trafalgar team able to put a bit more pressure on the Falcons team. Paris was working hard in the midfield and Haylea started to win some possessions. Gabby cleaned up everything that came her way and and the defenders did a great job of repelling attacks. With 16 minutes to go Maddy was reintroduced to the game and thirty seconds later made the most of her opportunity to score a wonderful goal. Haylea unleashed a number of shots that hit the outside netting of the goal and the Trafalgar team started to believe. Gabby tipped a shot onto the cross bar and the ball was cleared. Nat and Allyssa really started to dominate the midfield and Haylea fired a brilliant shot to score. Game on!! The ball moved up and down the pitch as both sides attacked. With 10 minutes to go a long range shot by Falcons was just too high for Gabby to reach and the lead was extended to 2. The Trafalgar team refused to buckle and had numerous shots at goal miss by millimetres. Falcons attacked repeatedly down the right wing but Tia jockied all the way to the goal line to frustrate them every time. With 5 minutes to go Maddy picked off a goal kick to score again. With both teams supporters roaring encouragement the Trafalgar girls did their very best to level the scores. Unfortunately it wasn’t to be and extra time wasn’t required as Falcons won 4:3. The girls must be congratulated for the wonderful fight back and the way they played the game and conducted themselves through their whole day. Their team spirit is second to none and they are a delightful group of young ladies. It was unfortunate that the gap was too great to bridge in the end. As a coach I can only be grateful to be part of this memorable game. The team has been an absolute pleasure to coach. Their desire to improve has been outstanding. I would like to thank Simone for team managing and worrying about the off field requirements this season leaving me to only coach. You have been a wonderful helper. I thank all the parents that contributed to the successful running of the team this season. The lines were run, marshals did their duty and the canteen was operated without issue. I also thank you for letting me coach your team. It has been a privilege. To Kara and the Under 12 team and parents I thank you for making the game days, that we shared the grounds, work so well. To Club President Dylan and the executive Committee; Templar and Raelene we thank you for the endless hours you put in to make the club run as smoothly as possible. To the junior coordinator Mark thank you for your efforts this season. To canteen manager Emma thank you for the hours spent cleaning, stocking and running the canteen. To the members of the senior women’s team who trained with us on numerous occasions thank you for you being excellent role models. MiniRoos will be playing @ home this Saturday, the 23rd of July. The hub day has been cancelled at Monash due to poor ground conditions – instead we will play an inter-club match at Trafalgar Rec. 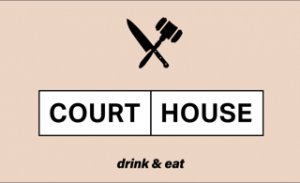 Precinct. Kick-off at 9am. Junior team games (Under 12 and above) have not been affected. 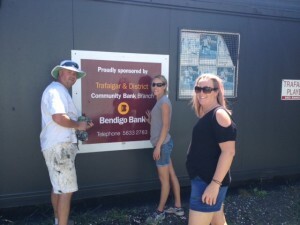 Headstart on 2016 Working Bee! Alan, Kara and Emma volunteering up a storm! The 2016 TVFC Working Bee started a week early. 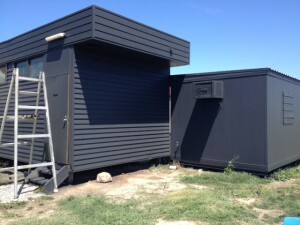 Thanks to Alan Silver Painting our change-rooms, toilets and storage containers have a new lease on life! Additional thanks to club committee member Kara who put in hours preparing the building for their new paint and assisting Alan. TVFC encourages all past, present and prospective players aged 16+ to come down this Thursday (21.01.16) at 6:00pm for an introduction and welcome session with our 2016 preseason to commence next week. This will be an important information session about our 2016 season campaign with the opportunity for questions and discussion. For any further enquires or interest please contact Dylan Wyatt – 0400505320.